I like finding wedding cakes that are unique – something you aren’t going to see at every other wedding. Today’s cake is that kind of cake. 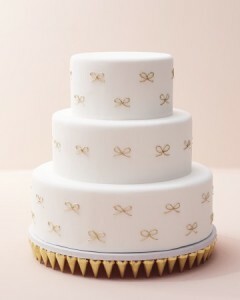 It’s not every day that you see a wedding cake adorned with tiny gold bows, and that makes me love it even more. This three-tier cake is perfect for an elegant reception with a small guest list. The cake features perfect white icing embellished with gold bows that were created with royal icing. I love how the little bows play off the gold spikes in the base. The cake is so pretty and elegant that a cake topper would take away from the overall look. And the thing I love about the bows is that you could always change up the color. Black bows would be incredible.